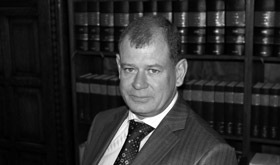 Herman van Eeden SC was called to the Bar in 1989. He was recommended for silk in 2007 and received his Letters Patent the following year. He currently serves on the management committee of The Maisels Group and on the treasury committee of the Johannesburg Bar. Newcity Group (Pty) Ltd v Pellow NO and Others, China Construction Bank Corporation Johannesburg Branch v Crystal Lagoon Investments 53 (Pty) Ltd and Others (12/45437, 16566/12)  ZAGPJHC 54 (28 March 2013). Van Eeden has a general litigation practice, and has often appeared in matters involving administrative law, banking law, contract, negotiable instruments, delict, insolvency, pension and insurance law. He has twice acted as amicus curiae in public law matters. He appeared in a number of reported cases, listed hereunder. Van Eeden is married to Olmay and they have two children: Steyn, a second year student at North West University and Helena, a Matric learner at Roedean School (SA). He takes a keen interest in outdoors life and enjoys spending time in the Vredefort Dome, Free State, where he commercially farms with cattle and sheep.